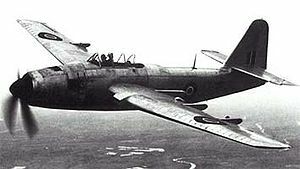 The Fairey Spearfish was a 1940s British torpedo bomber designed and built by Fairey Aviation for the Fleet Air Arm. It was one of the largest single-engine aircraft to ever operate from a British aircraft carrier. The Spearfish was designed by Fairey Aviation to Admiralty Specification O.5/43. Having learned the lessons of the Barracuda, the Spearfish had a much more powerful engine and an integral ASV anti-submarine radar (the external installation on the Barracuda caused problems with longitudinal stability). Problems with the Bristol Centaurus engine delayed the first flight until 5 July 1945. Only five aircraft were built before victory over Japan in August. After the end of the war and the proposal for a more advanced turboprop anti-submarine aircraft (which became the Gannet), further work on the project was stopped and an order for 152 production aircraft cancelled. The Admiralty refused to accept the Spearfish for service use. The aircraft had such heavy controls that in bad weather a pilot circling a carrier while waiting to land was forced to fly such a wide circuit that he could not keep the carrier in sight. Data from Fairey Aircraft Since 1915 Taylor, H. A.